The up and down year continues. After posting a 93 in my first game in Kota Permai with 1 par, 1 birdie showing, I switched drivers and putters and promptly shot an 85 at Palm Garden. It had nothing to do with the drivers and putters though because I was still awful with my drives and my new (or rather very old) putter wasn’t do me any favours either with a 3 putt on the 1st, 3 putt on the 10th and 3 putt on the 18th. However, my irons were just dialed in as I went on a birdie hunt on a few holes – and ended up with 8 pars and 1 Birdie for a somewhat respectable score. if I two putted those, I would have saved 3 strokes. If I played the somewhat easy par 5 smartly instead of smashing my driver into the water for a triple, I could have parred it maybe and shot a 79. I never broke 80 before in my life. A 79 for me would be like the pros shooting 59. Speaking of pros, how is Tiger doing? I did manage to catch a bit of his highlights at the Farmer’s at Torrey Pines. He was -1 after 11! And he had to go screw it all up by shooting +5 over the last 7 holes. I wish I can say that he is back. I don’t think he is. However, here is some mind boggling stats for you. Tiger Woods is ranked 663. Our great Malaysian Players – Danny Chia, Nicholas Fung and Gavin Green are ranked 276, 321 and 346 respectively. Yet, when he teed up, Tiger Woods, ranked 662 ranks lower than Jason Day, brought in crowds more than 4 deep. It’s like a football game between Germany vs Bhutan and everyone is watching Bhutan. It’s like watching Andy Murray play against Alberto Brizzi and everyone is going like: Alberto! I Love you! WTF is Alberto Brizzi? I don’t know. He is the 663rd ranked player in the ATP tour. So yeah – say what you like about Tiger – he is the main reason why I played golf, play golf and will continue to play golf. If he’s back, great. If he’s not, it’s still going to be Tiger being watched more than any golfer on this planet. A few posts back, I made a noise about how golf is so strange – that even hitting like 10 GIR, I can still manage to 3-putt 6 of these greens in regulation, and I threw away my putter – literally up in the air. Because I am so cheap, I had to go collect it back. Kota Permai is a really nice course to play in. The holes are challenging, the par 3s are memorable and the course setup is tricky and the two ending holes are worthy adversaries. However, breaking 90 hasn’t been easy for me there. I played 89-94-90 in my previous 3 outings there and it didn’t really start that great for me this round, after hooking my first drive into the woods and the second one as well. My first par came on the 14th, my favourite par 3, which is elevated, and usually require a strong pitching wedge to clear the front greens. I hit my shot to around 6 feet. Unfortunately, two of the other players we were teaming up against both slamdunked their shots – one of them to about 3 feet, and another actually hit the flagpole before bouncing 5 feet off. Both of them birdied. From there, I sort of struggled abit until the last par 5 where I putted in a 15 footer, followed by the next par 5 on the front 9, where I putted in another 10 footer. I looked and saw my ball nestling 4 inches from the hole – from arguably my worst iron approach shot of the day. Golf is a funny game indeed – sometimes, the good is not rewarded, and the bad goes unpunished. Kind of like our country, I think! It is. A funny game, that is. When you play like crap nuts, you sometimes still win like an immortal. When you play like an immortal, you end up losing like crap nuts. Palm Garden had always been a good hunting ground previously. Now, the new palm garden is a different beast. Yes, the length is no big deal, but the befuddlement on this New course would be the darn greens. Most if not all greens are tabletop, meaning if you miss these greens you will end up rolling down to New Mexico and having to loft up your shot again. It’s annoying. Another matter would be the bunkers and the green itself – playing very quick, and completely bamboozling me in this round. 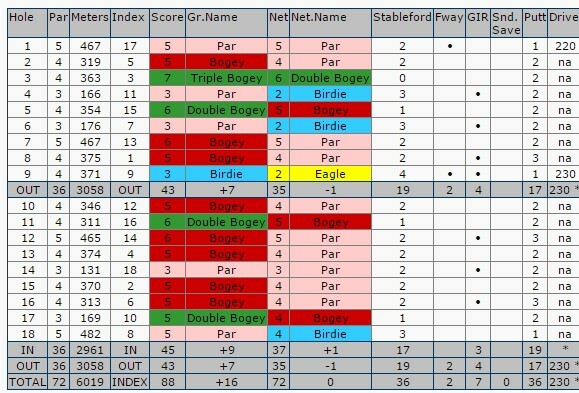 Think about it – 7/14 fairways hit for me is very good stats. 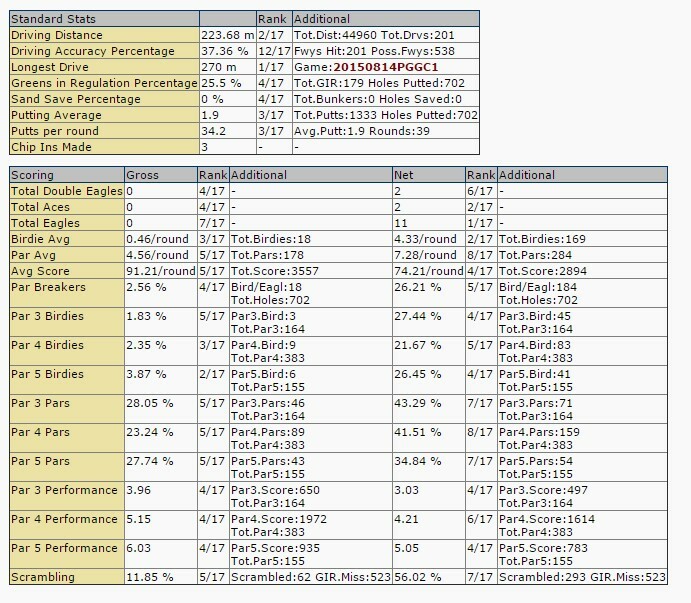 I average 39% meaning I hit roughly 5 fairways a round only. But I hit 10 greens in regulation this round. 10! My average is 23%, meaning I only hit around 4 greens in regulation this round. I 2.5x my average this round alone, and at one point, hit six greens in regulation IN A ROW. Out of 10 greens in regulation, I three putted SIX. I two putted two and I one putted two. That’s six bogeys, two pars and two birdies for my 10 GIR. What the heck is going on??! Putting had always been a middling aspect of my game, but at one time, when I 3 putted my fifth green in a row, I simply tossed away my putter about 20 feet in the air and told the caddy that she could have my putter. The very next green, I hit a tricky 10 footer for birdie. The other birdie occurred on the 8th, when my drive left me only around 50 meters, and I hit a half sand wedge to 1 foot of the hole. You would think this meant I won some money as well. No, I ended up losing all 3 frames of our sixers and forking out for lunch, that cost me RM100. a) A partners B, C partners D for the first six holes. The next six holes, everyone swaps, and the last six holes everyone swaps again so that everyone will partner each other once in the 3 ‘frames’. b) We play best ball and if that is square, then second ball counts. c) No strokes given. In todays game, we had a 13 handicapper, a 16 (me), and 18 and a 24. 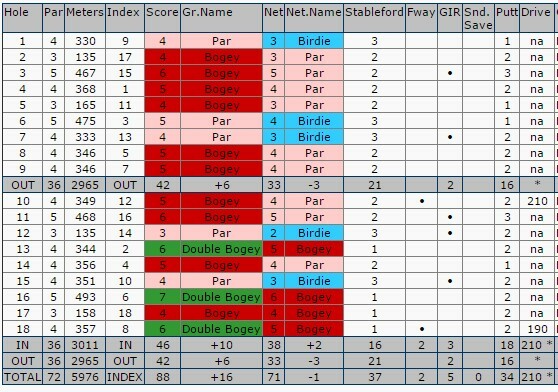 Even when I partnered with the 13 handicapper, he played so badly, the 18 and 24 handicaper won without strokes given. WHAT?! 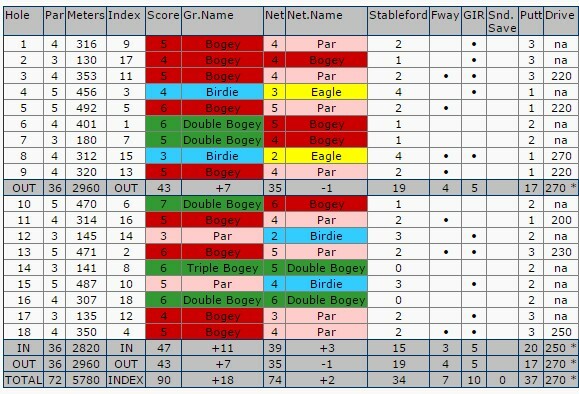 d) We played fringes – birdie, sandy par/birdie, escalation within the frame, twin pars/birdies for partners etc. One fringe=1 ball. e) We played variations of 3-1-1, (game-dormie-buy) meaning each sixer we are playing 3 balls for game, 1 for dormie, and 1 for the buy. f) Depending on our mood, we could play RM 10 or RM5 for a ball. So it could be a RM15-5-5 or RM30-10-10 for each sixers. Included the fringes, we could really lose quite a lot, for instance I lost 10 balls today despite playing one of the best round tee to green of my life (and one of the worst putting rounds of my life). If I putted well, I would have won all frames, saved RM100, scored around 84 or 86, and gone home a happy man. Golf is a funny game indeed. As long as I can keep the trend going, I will. I managed to hit a sub-90 round 3 in a row – which I think probably has never happened before, giving me some hope in this year’s pursuit of sub 90 target. As of now, I am averaging around 92 thanks to some explosive scores like 102 in KRPM, 96 in Palm Garden, 99 in Seri Selangor etc. But the last 3 games – Kota Permai, KRPM and Glenmarie has given me 89,88 and 88 – respective scores given my struggles in this game. Glenmarie game didn’t start out well. We played the back nine and I had a pitching wedge from the fairway on the first and shorted it. I skulled my chip and settled for bogey. Second hole, I had regulation and 3 putted from 10 feet. The 13th, I had an easy 9 iron into the green, pulled left, shanked my flop into the bunker and died. 16th and 18th were just very poor – easy par 5, and I got myself into loads of trouble in the woods, and on the 18th, I skulled my chip again – many times, after getting 2 to the edge of the green. At 46 on the front, I managed to turn around at the back. The amazing stats on the back nine was zero fairway hits. I was having a horrendous driving day which is so frustrating because the last two games, I was driving like a king. So today’s 80s round was basically a lot of recovery, and some reasonably good irons from bad positions. Glenmarie garden was playing benign. The rough was almost negligent and all my drives in the rough managed to survive relatively easy. In fact, I could have gotten 4 additional pars – I three putted the par 5 3rd, then I had an easy chip on the 4th which I skulled, and the last 2 holes I had easy chips which I also screwed up. If I can learn how to chip, I could be consistently scoring into the 80s! Let’s see if 4 in a row is possible – next round is at Rahman Putra, where I have NEVER posted 2 sub-90 rounds in a row eversince I joined the club 10 years ago.